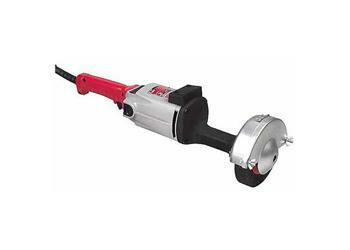 A coated spindle housing make this heavy duty, Milwaukee Straight Grinder comfortable to hold on to while delivering an extra heavy duty 15 amps of power and 5500 RPM. Equipped with a hinged face plate with wing nut fasteners for easy wheel changes, this tool can accept up to 6 inch resinoid bond wheels. Wire brushes can also be attached for cleaning rust from work surfaces, as well as buffing wheels for polishing. An impact absorbing tool rest is provided so that the tool can be set down safely as the wheel coasts to a stop. The spindle is 5/8 inch for use with industry standard accessories for the rated diameter capacity. This tool can be converted to a Tuck Point Grinder by purchasing the appropriate guard and Type 1 wheel.